HENRY COUNTY, Ind. -- The debate over potential wind farms in Henry County will continue after a vote Tuesday night. The Henry County Planning Commission voted to send the "wind energy conversion system" ordinance back to the county commissioners with no recommendation. The final decision is now in the hands of commissioners. The proposed ordinance would allow a wind energy company to build turbines 1,500 feet from any house or 750 feet from somebody's property line. Many people in Henry County have spoken out against the wind farms, giving reasons such as fear of blades and ice coming off the turbines, lowered property values, dust kicked up from the blades, and even fears that they cause heart problems and electromagnetic interference. 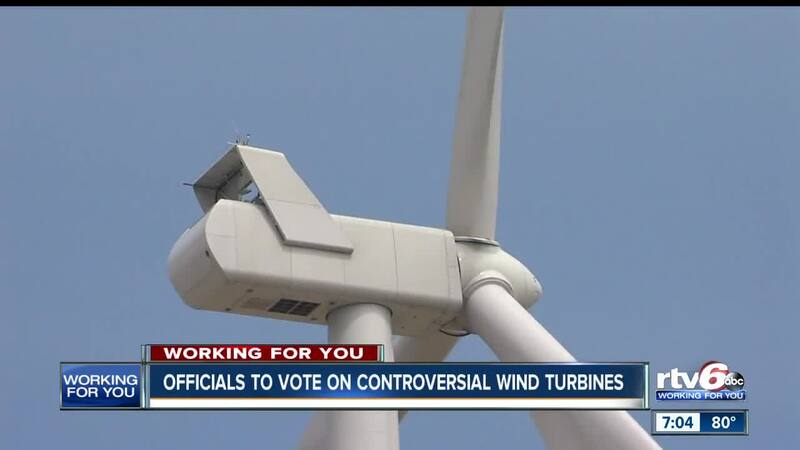 Studies are mixed on whether the turbines negatively impact one's health. A 2013 study in the College of Family Physicians of Canada found people who live or work close to wind turbines can have adverse health effects. A 2015 study by Australia's National Health and Medical Research Council found that the noise of nearby traffic was about twice as loud of a wind farm farther than 1,500 meters (about 5,000 feet) from a person's house. The study concluded that "there is no consistent evidence that wind farms cause adverse health effects in humans," but also said there was consistent but poor quality evidence that the noise is associated with annoyance. The NHMRC recommended $2.4 million (U.S. money) to further study the issue. But Dalton Armstrong of Armstrong Farms in Henry County says he's in support. "I think it's clean energy and it's better than getting it from the coal mines, so I think it's good in the long run," Armstrong said. Commissioners fear if they move the required setback farther away from homes -- it'll deter companies from building.